Bro. Vaman Rao Sudhakar Rao was born inTrivandrum. His illustrious father Dr. Vaman Rao settled down in Trivandrum in the early 1950s to set up the first Blood Bank in Kerala. He had his early education at the Holy Angels Convent and completed his schooling at the St. Josephs Higher Secondary School, Trivandrum. After he graduated in Commerce from The Govt. Arts College, Trivandrum he pursued his professional dream and qualified to be a member of The Institute of Chartered Accountants of India. He is now the senior and Managing Partner of a firm of Chartered Accountants M/s Issac & Sudhakar which he founded at Trivandrum with his partners in the year 1989. He has over two decades of experience as a Chartered Accountant in Practice in the area of Audit, Taxation and Consultancy. He has been very much involved in his Professional activities over the past decade and has presented several papers at various seminars in various professional forums. He was Chairman of the Trivandrum Branch of the of the Institute of Chartered Accountants of India in the year 2007-08. He is an active Rotarian and is a Past President of The Rotary Club of Trivandrum and also a past Assistant Governor of the District. Bro. 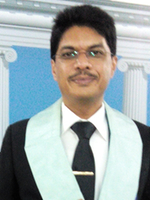 Sudhakar Rao was initiated into Freemasonry in the year 2001 by W.Bro. M.N. Kesavan Nair and has held various Offices in the Craft. He is married to Shubha and is blessed with two daughters - Varsha Sudhakar who is pursuing a Degree in Social Work and Raksha Sudhakar doing her Plus One at St. Thomas Central School. His mother tongue is Marathi, however being born and brought up at Trivandrum he is wholly a naturalized Malayalee! !